At the end of Sunday’s 60 Minutes on CBS, commentator Andy Rooney did some of his usual thinking out loud, praising Barack Obama: "I've lived through the election of a lot of American presidents -- more than ten, I think -- and about half the people I knew at the time hated one or the other of the two candidates...Maybe I'm reading the wrong newspapers and listening to the wrong people, but I'm not hearing anyone who hates Barack Obama." Perhaps Rooney should stop listening to his own network’s fawning Obama coverage and consult the 46% of the country that did not vote for the Democratic president. Rooney touted some of the president’s early decisions: "I think we've got ourselves a really good president with a funny name...Obama has frozen the salaries of people in the White House who are making more than $100,000...Obama has put limits on lobbyists who infest Washington. He reversed Bush's policy of making it hard to get information out of our government through the Freedom of Information Act." Rooney concluded his fawning by declaring: "Obama just looks good every time he does anything." 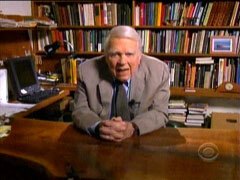 ANDY ROONEY: I've lived through the election of a lot of American presidents -- more than ten, I think -- and about half the people I knew at the time hated one or the other of the two candidates. You're probably too young to remember, but millions of Americans disliked Franklin Delano Roosevelt, even though he was one of our greatest presidents. I was too young to know whether I liked him or not, but my father was one of the people who hated Roosevelt. Maybe I'm reading the wrong newspapers and listening to the wrong people, but I'm not hearing anyone who hates Barack Obama. What's wrong with us, anyhow? Have we gone soft? I hope that isn't what it is, and I don't believe it is. BARACK OBAMA: Preserve, protect and defend the Constitution of the United States. JOHN ROBERTS: So help you, God? ROONEY: I think we've got ourselves a really good president with a funny name. Every new president makes some changes in his first few days. For example: Obama has frozen the salaries of people in the White House who are making more than $100,000. I personally think that anyone as important to be advising our president in the White House deserves more than $100,000, I don't want him getting a lot of cheap advice. Obama has put limits on lobbyists who infest Washington. He reversed Bush's policy of making it hard to get information out of our government through the Freedom of Information Act. In 1998, I tried to get the file the F.B.I. has on me -- something I said that an administration official didn't like. I didn't get the file. Maybe I'll try again. Obama just looks good every time he does anything. I hope he took time to have dinner with his wife and kids the other day.